Sometimes a quick, easy brewday is just what a brewer needs. 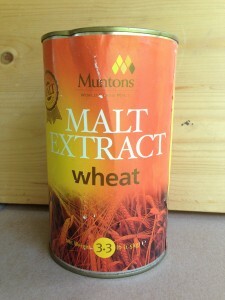 Brewing with malt extract is very convenient. And, if you boil a thick wort, then dilute it to working strength in your fermenter, you can brew beer on your stovetop. There are, however, a few drawbacks to malt extract and the way it is usually used. Because malt extract picks up a bit of color as it is concentrated, the lightest colored beers are out of reach to extract brewers. Likewise, the fermentability of malt extract worts is usually a bit less than comparable worts made strictly from grains. So, brewing very dry beers is not possible. In addition, as wort is condensed into malt extract, some of the malt-derived volatiles are lost and malt extract worts generally have less aroma than comparable worts made with all-grain methods. And finally, given that most extract beers are made by boiling a thick wort, then diluting it, brewing beers at the top end of the bitterness scale is out of reach. Of course, the limitations to brewing with malt extract can be counteracted by supplementing the extract wort with a partial mash. And, if a brewer can perform a full-wort boil, he (or she) can brew beer as bitter as he likes. However, even given the limitations of malt extract and typical malt extract brewing techniques, there are still a wide variety of beers that can be successfully brewed. And sometimes, the convenience of brewing an extract batch is exactly what a brewer — even an all-grain brewer — is looking for. I have a few malt extract based recipes that work great with regular stovetop extract brewing techniques. These recipes play to the strengths of malt extract rather than butting up against the limitations. (For example, when brewing a full-bodied beer, the typical level of fermentability of malt extract is a plus.) Likewise, these recipe are all meant to be simple to brew, because we all experience periods when our amount of free time is limited. Sometimes a quick extract beer is just the thing to keep the beer supplies from dwindling. In this series of surefire extract brews, I’ll present recipes for mild ale, English brown ale, brown porter and a Scottish 70/- (seventy shilling) ale. Today, I’ll kick off the series with my extract recipe for American amber ale. There are at least a couple different ways American amber ales are formulated. Some rely on a large amount of low-color crystal malts (10–30 °L), often with a dose of CaraPils malt thrown in, then colored with a small amount of dark malt (usually chocolate or black malt). The amount of dark malt is enough to shift the beer’s color into the red, but not so much as to add perceptible levels of roasted grain flavor to the beer. Alternately, the red color can come from fairly large additions mid-range crystal malts (40–80 °L), with less dark malt. The former are full-bodied, with a light caramel flavor. The latter are generally moderate-bodied (or between moderate-bodied and full-bodied) and have a more of the character of the darker crystal malts (with strong caramel, burnt sugar, raisin-like notes). And of course, the level of hopping can range from moderately low to almost IPA levels of intensity. My extract amber is inspired by Cambridge Brewing Company’s flagship beer, Cambridge Amber ale. My beer isn’t a clone of “Camby Amby” — the hop varieties are different, for example — but is similar in that it is moderate-bodied and has a complex caramel taste. I’ve bumped the hop levels up a bit, especially the late additions, but not so much that the beer loses balance between the malt and the hops. In all, this is designed to be a “just plain beer” kind of beer, in the best sense of that phrase. Nothing over the top or sensational, just an excellent everyday brew. I’m a rookie brewer and I try to brew all grain beers, but also extract beers. Now I’ve in my demijohn a small batch of American Amber Ale with DME Light and Caramunich I as steeping grains (you can see in http://cervezarudimentaria.wordpress.com/2013/11/07/a-por-el-tercer-lote/ if you want). Brewing small batches is a great way to try a bunch of new things without taking up too much space or generating too much beer. Enjoy the beer recipes. I’ll post one a week.